The new year sort of gives us all a chance (or excuse) to start over with a "clean slate" for the next 12 months. We all make resolutions to better ourselves and hopefully, with a lot of will and perseverance, we can be strong enough to hold true to these resolutions for the rest of the year, and maybe even our lives. Paula Hyman (left) and parter-in-crime Laura Westmoreland. If you have marched before, you come home from tour and think to yourself, "Look at me ... I am hot. There is no way I'm going to gain any of the weight back that I lost this summer." Four months later, while you're at Burger King, you realize that you failed your mission. You can't eat like you can during the summer because you aren't marching around for 16 hours every day -- eventually, it will catch up with you. So, I'll go ahead and drop my guard here. My resolution is to be in ridiculous shape by move-in. And it's not like I come to spring training getting out of breath just walking to stretch and run. I just want to reach a certain level of shape. So I'm going to work out a whole lot, eat healthy, and we'll see what happens. 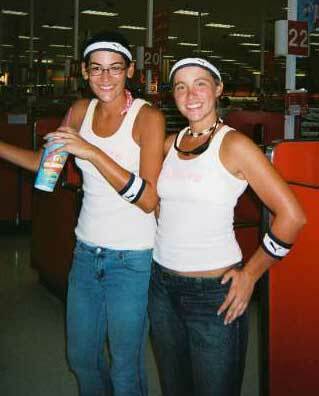 Now that it is actually 2005, this new drum corps season seems more real to me. There is a girl playing bass number one at the Cadets -- her name is Melanie. I think that is awesome. I am sure many people will have something to say about a woman bass drummer, but guess what? If she wasn't good enough, then she wouldn't be number one at the Cadets. In this activity, if you're a girl and not in the color guard, there is a good chance people will initially have something to say about you. Not so much in the horn line as much as the drum line, though. People just expect us to be bad only because we are girls. Our center snare is a girl and her hands are ridiculous. If you are good you're good, whether you are a guy or a girl. I like to prove people wrong and I know Melanie will do the same. We have a camp in nine days and I am excited as usual. Let's talk about something I am not excited about -- moving. My roommate, Mary, is moving to Oregon on Friday. Now that the "day" is getting closer and closer, we're both getting pretty depressed about it. She's going to be living with her boyfriend, which is awesome because they definitely shouldn't be apart any longer than they have been. As for me, since I don't have a roommate anymore, I'll be moving back to NYC to live with my sister again. I love my sister and it is going to be a lot of fun, but I would be lying if I said I wasn't going to miss living with Mary. I don't think I could have picked a better roommate. It's like we're the same person. I've never laughed so much in four months -- and I laugh A LOT more than normal people do. This is turning into more of a "Xanga" or "Live journal" instead of a drum corps article, but it all relates to drum corps, actually. I think it was my first or second article where I wrote about the amazing people you meet and friends you make from marching -- Mary is one of them. So see, it all comes back to drum corps. I can't even explain how many incredible friends I've made from marching. It sounds cheesy, I know, but it's true. So if you're thinking about marching, get off the couch and do it. There is still time, and it will change your life. OK, enough sentimental stuff. Christmas was crowded but a lot of fun, just like I thought it would be. Seeing my brother and his family come all the way from France was nice, and we all spent a lot of quality time together (and ate really good food too). A few days after Christmas I went to a John Mayer concert with my friend Christen in NYC. It was blues concert and was definitely cool. He's a ridiculous guitar player and he really gets to showcase that when he plays jazz and blues. It was fun. For New Year's Eve I went to my friend Rich's house. Everyone in his house marched or is marching drum corps so it was pretty awesome. I met a lot of people from the Bushwackers senior corps and some old Cadets too. I met someone who marched Garfield Cadets in 1987 on baritone -- pretty cool. So all and all, I had an awesome break. It's time for me to get going. Enjoy your week! Paula Hyman is a fourth-year member of the Cadets where she is the mellophone section leader. She is 20 years old and currently single. Originally from South Florida, Paula recently made the move to Allentown, Pa., to work for YEA!, the umbrella organization of the Cadets, Crossmen and the U.S. Scholastic Band Association. She ages out in 2006.